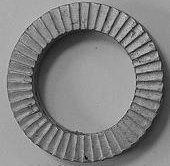 M10 Steel anti-vibration wedge locking washer. Heico-Lock positively locks bolted joints using tension instead of friction. Inclined cams on the inside of each washer and radial teeth on the opposite side work together to securely lock the bolt in place.